" I used to spend over $500.00 per month on long distant telephone calls in my Miami office. 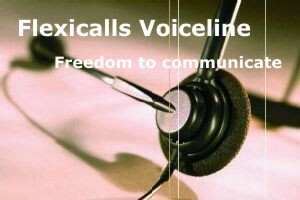 With Flexicalls Voiceline, I now spend $180.00 per month between my Miami office and two offices in Jamaica." "A 30-minute call to my friend in Germany would cost me $3.60 before, now with Flexicalls I pay only $0.60 for that same call." Flexicalls is a service that is changing the telecommunications world by offering consumers an innovative, feature-rich and cost effective alternative to traditional Plain Old Telephone Service (POTS). Flexicalls is offered by FlexiSystems, Inc, a Telecommunications and Information Technology company, based in Miami, Florida. The management of FlexiSystems has over fifteen years experience in Telecommunications and Information Technology. Our service is powered by Net2phone, a world leader in delivering voice services over data networks. We aim to provide worldwide voice connectivity to our customers through existing high-speed Internet connection. The technology used provides customers with more flexibility in communicating with friends, relatives and business associates. In addition, our customers enjoy a product that is cost effective and delivers better sound quality than previously experienced with POTS. Get notified by Email each time someone leaves a Voicemail on your Flexicalls Voiceline service. Manage your Flexicalls service from any computer that is connected to the internet.